Welcome to my blog! Anna’s Secret Legacy has now made it around the world and I have had the good fortune to have had the most amazing journey. The people I have met have been incredibly interesting. Just back from LA producers conference. I met over 30 Academy Award producers. Jeff Dowd (who started Sundance with Robert Redford) and Al Ruddy (who produced the Godfather along with Hogan’s Heros) were so funny. They had me mesmerized with their stories. Larry Katz at Morgan Creek (The Good Shepard, Ace Ventura and over 50 films) was an incredible wealth of knowledge. More on this to follow! Last night M.Night Shyamalan and his gracious wife opened their home up to honor The Philly Film Office- What an amazing party! 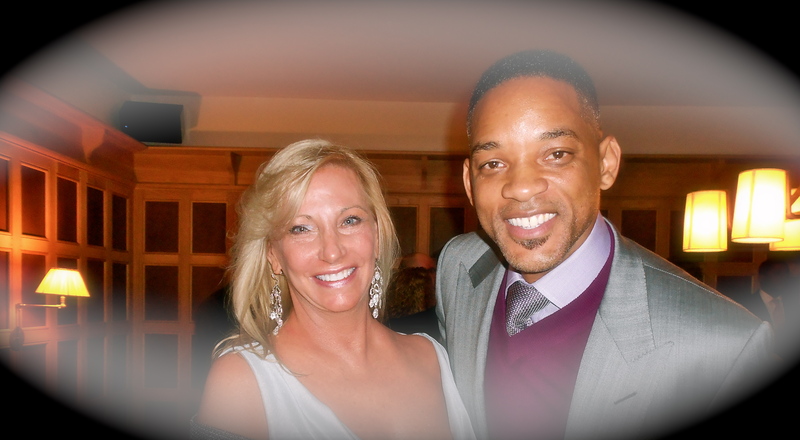 I had a delightful chat with Will Smith who is incredibly charming. More to follow soon! Stay Tuned! and thank you for following the progress of Anna’s Secret Legacy as we now have the film Script as well as the novel! Many Thanks to all! This entry was posted in Amazon, Anna's Secret Legacy, Anna's Secret Legacy Blog, Annas secret legacy novel, Banks, Barnes & Noble, Book Blog, Book Signing, Chapter 5 Excerpt, Gold, Hollywood Stars, Love Affair, Love affair, NJ, Philly Ad club, Pilots, Pressroom and events, Saratoga, Scientific Discovery, spies, Travel, World War II and tagged Amazon, Anna's Secret Legacy, Hollywood stars and producers, Kindle, Love Affair, Molecular Secret, WWII. Bookmark the permalink. ← Anna’s Secret Legacy-A compelling Story How Love Is The Strongest Weapon When Nations Collide, And Evil Threatens!